Hebrew Cemetery was established in 1850 when prominent Jewish families purchased a rectangular plot fronting Princess Anne Road and extending northeastward. At some point, the surviving graves from Tidwater's first Jewish burial ground, Power Point Cemetery in Berkley, were transfered to this land. There was considerable conflict from 1859 to 1880 as to which Jewish congregation rightfully owned the cemetery. The issue was resolved in 1880 with the creation of the Hebrew Cemetery Company. This arrangement lasted until 1957 when the City of Norfolk agreed to add Hebrew Cemetery to its roster of burial grounds. Hebrew Cemetery's epitaphs clearly show the origins and development of Norfolk's Jewish community. The Myers and Nones graves, transferred from Powder Point, are those of second generation Americans whose families came from Holland and France in Colonial times. The bulk of the nineteenth century burials were people of German origin. There are also Russian interments from the 1880s following the outbreak of pogroms in that part of the world and the subsequent immigration of Jews to our shores. Search for an interment in Hebrew Cemetery. Access a listing of Hebrew Cemetery interments. Learn about Norfolk Notables interred at Hebrew Cemetery. As a 501 (c) 3 nonprofit organization, NSCC welcomes your support through contributions! 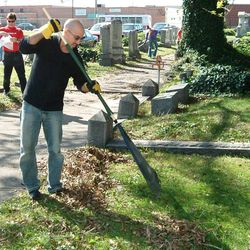 All funding goes directly to ongoing conservation projects within Norfolk's historic municipal cemeteries. Click on the Donate button below to make a tax deductible contribution to the NSCC. If you are interested in getting involved as a NSCC member, Sign up here for membership information. The Jewish community in Norfolk does an excellent job of looking after Hebrew Cemetery. Surrounded by busy thoroughfares on all four sides, Hebrew is a beautiful oasis in the middle of a working class, industrial neighborhood. Hebrew is not in great need of restoration at this time. However, the NSCC stands ready to assist with conservation projects at Hebrew Cemetery as they arise.